The day after the first direct flight Seoul-Palermo, the mayor, Leoluca Orlando, met at Villa Niscemi the Ambassador of the Republic of Korea, SE Lee Yong-joon. The Korean Ambassador also visited the Teatro Massimo, seeing La Bohème. Mr. Lee Yong-joon and the Mayor discussed about the possibility of developing collaboration between Palermo and Korea on the cultural and economic-commercial relations. Specifically, with regard to the enhancement of the UNESCO path, it was discussed the possibility to set in Palermo a “club Unesco” (whose global coordination has its headquarters in Korea) and the participation of the Asian country in “Manifest 2018”, the international event of contemporary art that will be hosted in our city. It was also discussed the possibility of organizing a bilateral trade relations Sicily – Korea. The distance with Korea is 9,200 kilometers. 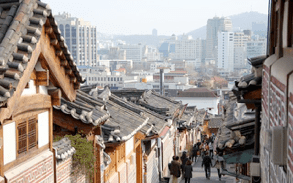 Seoul has about 9 million inhabitants. The surrounding area counts 25 million people, ie almost half of the entire population of South Korea.